Writing Updates for August 2015! Hello! Enter The Vortex Vol. 2: Surreal Tales of Horror and Fantasy is available now on Amazon.com! You can purchase the book for $2.99 or read it for free using your Kindle Unlimited subscription. Regardless, thank you for the support. Your readership means the world to me. Words can't accurately explain how grateful I am for your support. Furthermore, it allows me to write more books, which I'll conveniently segue into now. 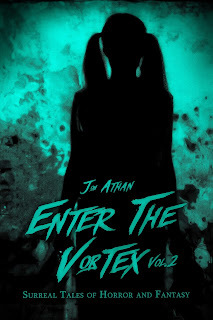 Currently, I am working on Enter The Vortex Vol. 3. The book will feature a more balanced blend of science-fiction, fantasy, and horror. The stories will feature androids, scientific experiments, phantoms, cults, special abilities, and much more. At its core, it's still a horror book, though. Expect some disturbing imagery, dreadful suspense, ominous atmosphere, and, of course, the unexpected. Enter The Vortex Vol. 3 is currently in the editing process and I am targeting a September 15, 2015 release date. Keep your eyes peeled for more details as we gradually approach said date. Aside from Enter The Vortex, I'm also hard at work on a new standalone book. Project: 10D is a new horror concept I am working on. The book reads as a traditional horror anthology, but all of the stories are interconnected. I felt like this allowed me to build a more novel-like book. It's certainly different from my usual work, but it's also something I've really enjoyed writing. It's coming together very well and I'm aiming for an October release date — as usual, keep your eyes peeled for more details. What awaits beyond the horizon? Well, that will be completely up to you. If you're vocal about the books you enjoy, you can dictate my future books. Did you enjoy Enter The Vortex? Leave a review or send me a tweet and I'll consider writing more. (I absolutely loved writing this series anyway.) Although I write for myself, I also enjoy entertaining and pleasing my audience. Regardless of what awaits, thank you for the support.